I had a letter from the House of Lords. The writer thanked me for the copy of Border Line that I had sent “because we are debating the Assisted Suicide Bill…”, apologised for taking so long to read it, owing to so many other commitments, and gave me his/her comments on the book and the topic. So far so very surprising and gratifying. BUT I did not, to my knowledge, send them a copy of Border Line. I did write to another member of the House of Lords, to ask them to support the Assisted Dying Bill currently making its way through parliament. I argued from personal experience for individual choice in end of life decisions. I didn’t mention my book – Border Line is fiction and only tangentially related to the topic. Now memory is a funny thing and it is always possible that I had a whim, parcelled the book up and posted it to this person, and that I failed to record it on my list, or write a letter to go with it, and yet their letter implies that it arrived with at least a note from me. Curiouser and curiouser. The letter is very generous and kind, and indeed it is astonishing that someone this busy should have read my novel and bothered to write and thank me. However there were also some jarring notes. The bill is for ‘Assisted Dying’, not, as they suggest, ‘Assisted Suicide’ – there is a difference. They interpreted comments made by Joanna Trollope about her own wishes not to be a nuisance in her old age and her preference for being able to choose assisted dying when her time came, as implying that people who had become a nuisance should be put away whether they wished it or not. This is a tricky area, but I believe it will be possible to draft legislation which allows those of us who have expressed a wish to be helped to die when that time comes, to do so, while also protecting anyone who wishes to stay alive as long as possible. And the second puzzlement? 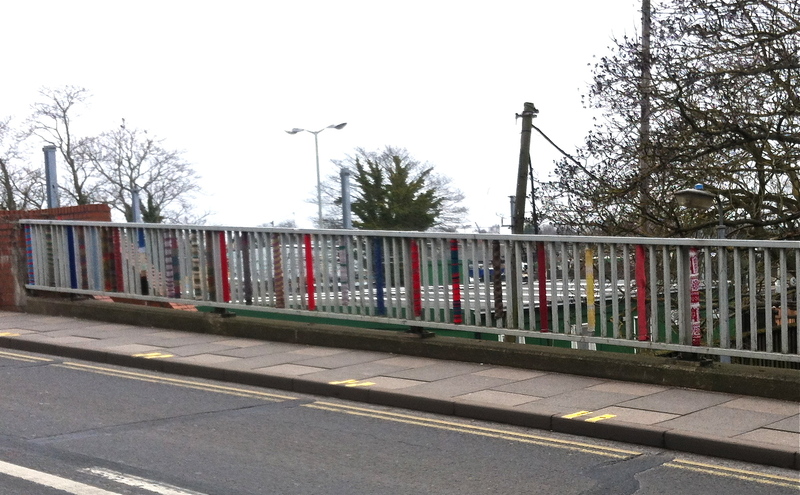 Knitted jackets for railings??! 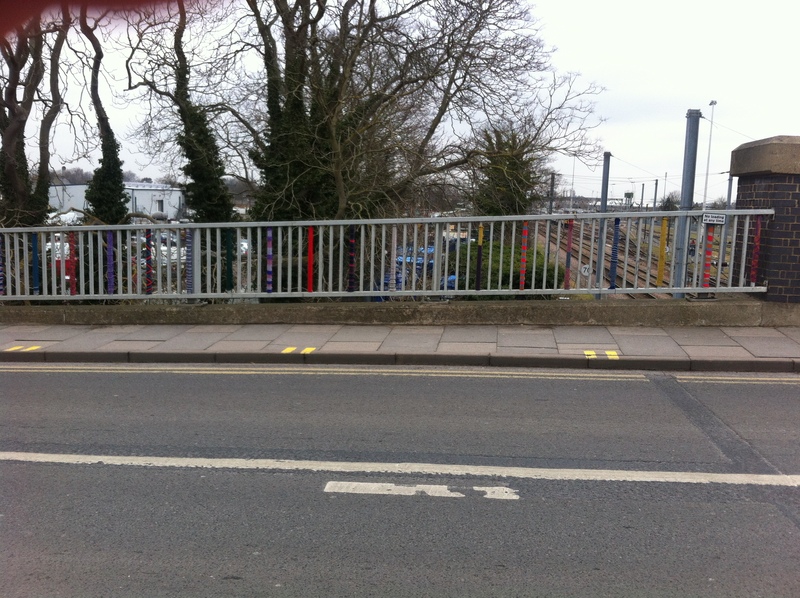 This entry was posted in Reading, Writing notes and tagged assisted dying, Assisted suicide, border line, Hilary Custance Green, House of Lords, knitted covers, railings by hilarycustancegreen. Bookmark the permalink. It seems to me that someone has posted a copy of your book on your behalf. Is that possible? I do not believe you could have done this and not remembered. Yes, I am assuming you are right and that this is what happened… but my work has taught me never to assume that my own memory is not at fault, so I have to leave that thin possibility open. Memory problems with a close relative are causing me a lot of problems now . Repetition alone us leaving me tuckered out and at times demoralized. So I have decided your memory is fine! A kind thought. I hope you are right. I do know what it is like to care for relatives with memory problems and it wearing beyond belief. I think it is a compliment but rather spooky. Did they write to you directly or via the (self) publisher? How did they get your address? Big Brother. My address and “Mrs Green”. The back of any packet with the book that I sent out would have had Threadgold Press plus my address… my correspondent would have had access to a research assistant, though this was very much a hand written letter. It is either me and a brain-fade or a friend or relative. I hope you are right and shall put out some feelers. I am interested to know how many people share the feeling that this of us who want it, should be able to opt for assisted dying. 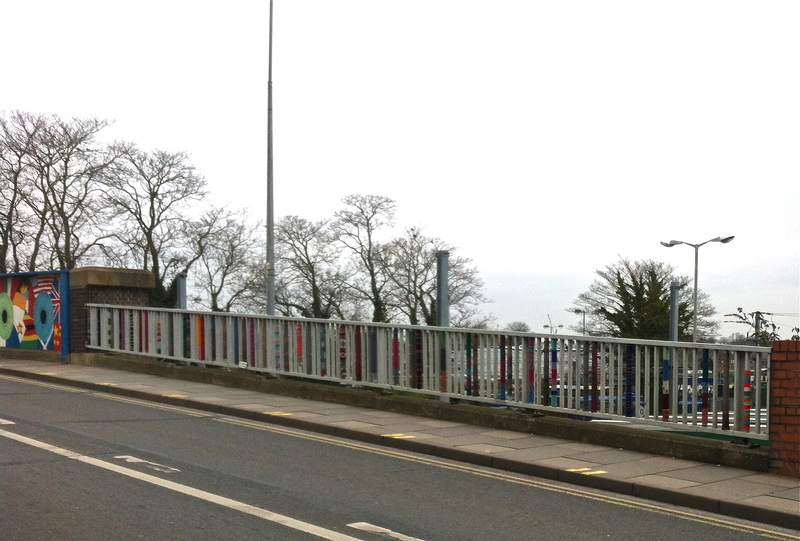 As for the knitted jackets, I rather think they have been there for several years – they just quietly increase each year. I don’t what happens when they go over. Indeed I am enjoying the feedback, and know that it is always possible I missed a record (though I would have had to fail to record three separate moves which is odd). I went with Amazon this time. Last time Amazon showed my second novel (as they do any book with an ISBN), but claimed it was out of stock and people got frustrated trying to buy it. I had exactly the same thoughts about the knitted jackets, I must return and examine them more closely. Ha! Cynthia said it before I could, dash it!, what about those poor unwrapped slats? I’m with you, Hilary, on the memory thing. I often feel a parallel universe is happening all around me….. Oh, how I hope progress is made on the issue of “assisted dying.” For all our sakes. 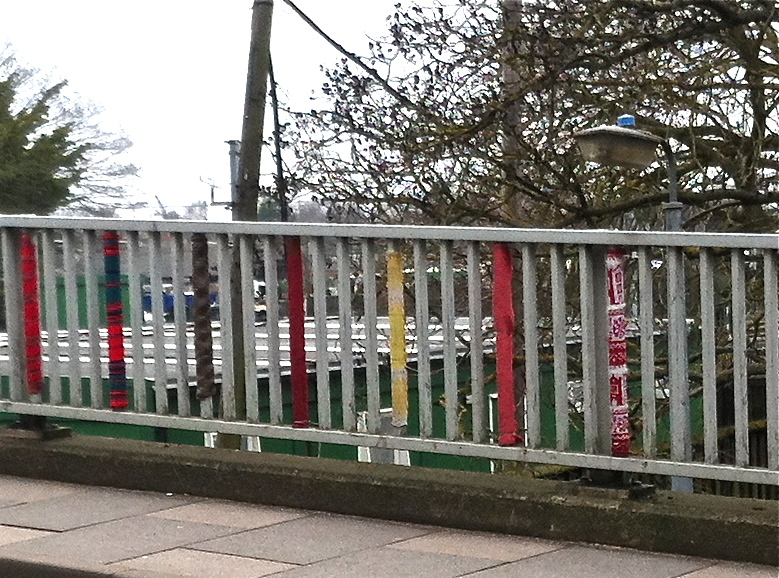 I think that the knitters will eventually cover all the slats. I seem to remember this same area with just a few covers a few years ago… but is it one or several? My life experiences have made me very keen to have the assisted dying option available. I am very sure my correspondent above will be against it, but the bill is still going though parliament. I agree. And from what I have read about the results so far in Oregon, it is not over-used and has been a boon to this who have needed it and a safety net for those who just wanted to know that they could use it. Let me put it this way, Hillary— I am so glad that I live in oregon if I ever do need to use it. Could it be, Hilary, that you had a mailing list on which your contact at the House of Lords was included and that you sent out your book to everyone on the mailing list willy-nilly? To my shame, I have sent out LinkedIn requests to editors (quite important ones, at womags) by accidentally agreeing to allow LinkedIn to contact everyone on my (email) mailing list. But it’s great that he/she in Ermine read it. My mailing list send-out only invited friends and family to buy (none in ermine that I know of). My list of direct mailings of review copies and free gifts wasn’t that long, but it’s still possible that I had a mad moment… the pre- and post-publication months were a bit crazy. I am truly impressed that they read (and apparently enjoyed) it, though we would clearly not agree on very much in life. At least it’s a happy kind of mystery. Very puzzling on both counts. I hope you find the answers to these mysteries. By the way, did I ever tell you that I read Border Line (and that every time I think of the title the Madonna song pops into my head, which is barely worth mentioning except that I had completely forgotten about it until I got your book)? I thought the book was excellent, it kept my interest from the first page to the last, and indeed I found it difficult to put down. It was of particular interest to me bearing in mind my brother’s disappearance, because he went missing in a mountainous area and it’s my belief that he may well have taken his own life. I don’t believe he planned it in advance as your characters did, but it was fascinating to read the thinking behind the decisions of each of these people. I’m not sure what I think about assisted dying, I feel pretty neutral about it for myself and it’s difficult to put yourself into someone else’s shoes. I do think if people feel strongly about it they should be allowed to make that choice, however. Thank you for such a brilliant read, it’s one of the most enjoyable books I’ve read so far this year. It is very brave of you to read Border Line, given the painful mystery of your brother’s disappearance. My work (as an experimental psychologist) has shown me how often people are like icebergs in that there is a lot more underneath than the face you see – not deliberately hidden, just part of the complexity of being human. I sincerely hope you find the answer about your brother as, apart from the pain, the mind cannot help continuing to check all the possibilities. I was thrilled to pieces that you found Border Line a good read (I’m afraid I didn’t even know about the Madonna Song – I’m the wrong vintage, I guess). Believe me, there is NOTHING that gives me greater pleasure as a writer than knowing that something I wrote gave another person enjoyment. I have seen people to their natural end, and one of them did (he had always said he would) ask medics to help him go – which they could not. I have also known someone who went to Dignitas (both after I had written BL). I would like the choice myself, but it has to be an individual one. May I quote from your comment on my website? Your work must be fascinating, psychology is a most interesting subject. The iceberg metaphor is a good one, I’m sure we only ever see a fraction of what makes up any individual’s complex personality. Thank you for your kind words about my brother. A definite answer of some sort would be extremely welcome. It would be a huge relief to stop the ceaseless theorising about what might have happened to him. Members of my family have different opinions and we go round in circles discussing the likelihood of one theory over another. It must be difficult being with someone at the end who wants to go but isn’t allowed to make that choice, particularly if they’re in a lot of pain. I remember my granddad before he died sometimes pleading with God to take him. Although it was upsetting to hear, I really wished he could get what he was asking for. Please feel free to quote my comment on your website. I was in two minds about reading the book at first, because I wasn’t sure how it would make me feel, and although I’ve recommended it to my parents, both of whom would, I think, enjoy it, neither of them have felt able to try it yet. What most surprised me about it was that I found it uplifting rather than depressing and at the end I was left with a feeling of hope and optimism. Writing a book that gives the reader that experience is a great achievement. Your parents, like you, are living with an impossible open-ended pain, and understandably can only deal with things they feel they can cope with on a daily basis. Thank you so much for telling me that you found Border Line ultimately uplifting. I worked so hard to try and make this outcome, but had no idea if I had succeeded. I think finding how to make other people feel good and realising that anyone can do that is the most empowering thing. I also genuinely believe that life is a matter of choice and for some people, either through circumstances, or more often, due to some unlucky circuits in the brain, the better choice for them may be to quit. Congrats on receiving such a letter, no matter how they got your book. I’ve never considered sending out actual copies for review, but on social media, have asked (begged, nicely?) for readers to write reviews on my Amazon page. Not only is this letter a boost for you, it also makes for an interesting blog post to make your followers puzzle and remark. Myself? I’m all for assisted living and assisted dying, at the wish of the individual. Yes, I feel privileged that this person went to the trouble of reading it. I only sent out a handful of copies for review and to particular people; most have vanished. I feel shy about asking for Amazon reviews, but only a tiny proportion of my sales are through Amazon, so this is not a big deal for me. Indeed puzzling but any of the theories proposed could be right. I’m with you on assisted dying. I’ve felt like that for a long time and recently my father’s illness (he’s now passed away) made me even more convinced that should be an option. The knitting… I remember having some training and somebody (off-topic but probably the most interesting bit of the presentation) showed us some pictures of ‘guerrilla knitters’, people who decide to knit and cover public furniture items or things (like a phone booth). I’m sure that’s not in the same scale but it made me think about that. And thanks for coming by my blog to comment. I think most people who have had any prolonged encounter with dying, and who do not already subscribe to beliefs which forbid assisting dying, are in favour. We intervene very heavily to prolong life at the moment, it seems to me that intervention, with consent, to speed things along a little, must be possible. 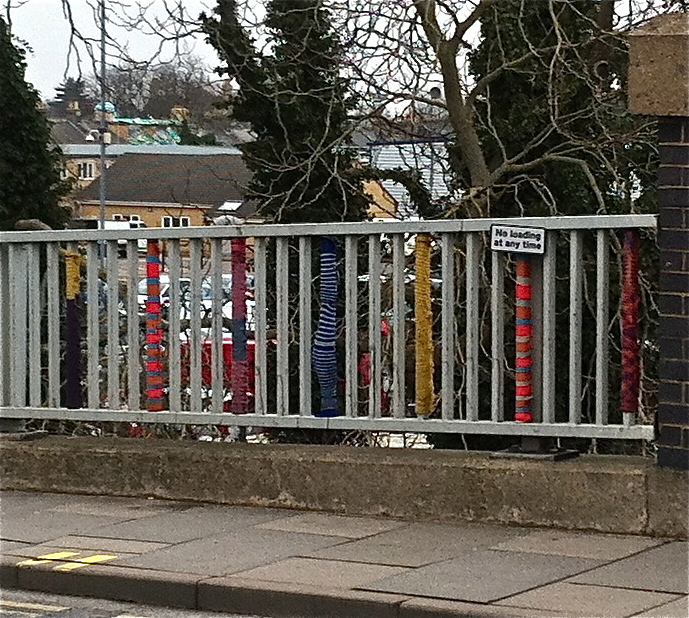 I love the randomness of the guerrilla knitters; these are harmless and joyful. I like how the one knitted slat has the “No loading at any time” sign just above it. As to the issue of the mystery book-sender . . . I hope you puzzle out the friend/relative who posted a copy of your book; at least the feedback was positive, even with the official’s misunderstanding of assisted dying versus assisted suicide. I can’t really encompass the breadth of my feelings on that in a comment, other than to say I support the wishes of that individual person and believe assisted dying should be an option to all. Border Line sounds like a worthwhile read; if it’s anything like the “Barbed Wire” short story, I’d say it’s staggeringly good and a must-read. I presume it’s literary fiction (if one must classify it)? I’ve seen both covers, and like the one with the woman in the window best (although I am a nature-lover, seeing a person on the cover lends a different timbre to what I think might be inside). I rather like the sign too. Yes, I hope we can arrive at safe legislation that will allow individuals to choose assisted dying if they wish for it. I believe my writing is more ‘middlebrow’ than literary (a sort of between literary and genre), but to be honest, I don’t really know, but I’m sure you are right about the cover, the story needed a figure.